Despite the common belief that an inheritance of money and material possessions is valuable, when the life of someone dear has been lost the perceived value of their financial assets depreciates rapidly. What’s the point of $20,000 when your Mom isn’t there to share your wedding day or your worst hour? Of course, writing a Will and taking care of our financial assets is essential for both legal and practical purposes. But what really matters are our “Emotional Assets” — the memories, family history, wisdom, life story, values, image, love and affections that we can capture and share with our children and grandchildren through a Legacy of Love; a precious gift they will treasure forever. That’s why its so important to know how to create a Legacy of Love and Realize the Gift in Goodbye, especially if . 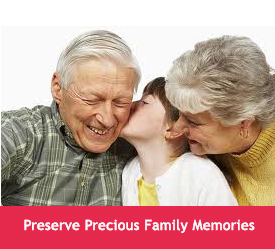 . .
You want to preserve your personal or family history for the next generation? You have aging parents and worry about how to converse with them regarding end of life issues? You are struggling to come to terms with a terminal illness? You work in a risky profession that causes you to worry about what you can do to protect and support your family if something were to happen to you? You have lost a loved one and wished they had done more to prepare and care for you in your grief? You work in the caring professions with the terminally ill and their families? You are struggling to come to terms with the loss of a loved one? If you answered YES to any of these questions, then you’ve come to the right place. We’ve collected and provided an enormous wealth of resources, books, websites, tools and products that you can use to share your own loving legacy and to better understand the stages of grief. Simply follow the 10 simple steps proposed by Grief Expert, Gemini Adams, in her multiple award-winning book, Your Legacy of Love: Realize the Gift in Goodbye or read the various articles and advice provided here.